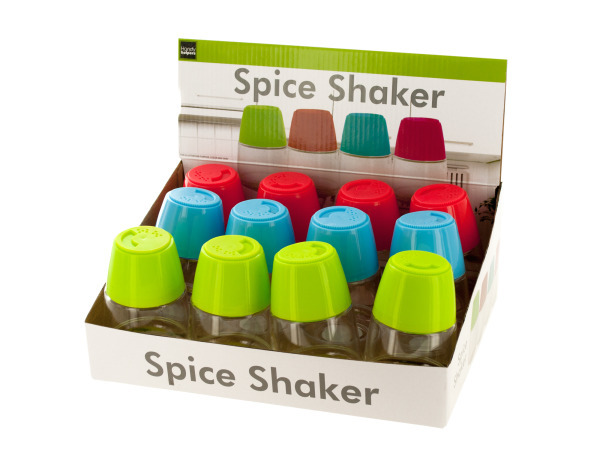 Perfect for salt, pepper and other spices, this Spice Shaker features a durable transparent plastic container with a colorful plastic screw-on lid with a sliding top for shaking or pouring spices. Measures approximately 4" tall with a 2.5" base diameter and 1.75" top diameter. Comes in assorted colors. Comes loose with a UPC label. Countertop display comes with 12 pieces.